The Chicago Monogram Design Center (MDC) brings designers to Chicago, Illinois, for two-day experiences to learn about Monogram, the design process, our appliances – and even cook with them! We interviewed each designer to learn a little more about their background and design experiences. Today we’re featuring Fred M. Alsen with fma Interior Design. Fred: There was never an “Ah ha” moment for me; being a designer is just part of who I am. I go into people’s homes for the first time and I start rearranging the spaces’s furniture and tchotchkes in my head. You could say there is a constant conversation going on between the room and I.
Fred: When I was asked to talk about a project I enjoyed, that was a tough one for me. I truly enjoy every project I work on. If I don’t feel there is a fit with the homeowner, or I can make a difference in the space, I don’t take a project. Recently, I installed a kitchen in a townhome, in a building which once was a banjo factory! Before we even go inside, the street of homes is interesting. It is the very well-heeled neighborhood of Lincoln Park in Chicago and the street has multiple homes on it which run in the tens of millions. The building, the old banjo factory building, runs perpendicular to the street and is constructed from gorgeous old Chicago brick. The color of brick is so hard to explain, but it almost a putty-based color with a hint of a warm rose hue – with a slight undertone of copper. I mention this, as the exposed brick carries over into the home’s interior, specifically the kitchen, and this played a role in the color direction of the kitchen. The request for the remodel included replacing the poor attempt of the previous remodel done to the home before current owners (a couple who are academics and their teenage son). They wanted a layout which worked for the way they lived and used the space (there was just no work flow to the kitchen prior), and of course, increased storage. The husband and son do the cooking and the wife likes to bake on weekends. This is the space where their living converges and the desire was for a more authentic feeling to this space. With a 13’ ceiling, original wood posts hailing from the banjo factory days, and the exposed Chicago brick, I just couldn’t wait to conspire with history on this project! The previous kitchen only incorporated half the kitchen area and was not laid-out for multiple cooks to work together. The husband wanted his own prep and cooking area – clear of “other traffic.” The wife desired a separate area for her baking and cleaning – and, most importantly a place for family to gather in the kitchen to eat and work. Before we even started in the kitchen, we replaced the 3” red oak flooring (also installed during last remodel) throughout the 1st floor. The staircase also received a new look with a 5” natural walnut plank to each step to lend a current look. One of my favorite aspects of this remodel was seeing the old white plain glass windows replaced with Marvin wood divided glass in a bronze finish; an architectural detail, which gave a nod to the old iron windows which are normally found in old industrial buildings. I designed custom window sills made out of salvaged wood beams and embedded copper elements in them to pick up on the original copper air vent pipe we found hidden within the old granite box backsplash. The extent of that copper air vent pipe was a “surprise” we discovered during the remodel! Rather than fighting it – we honored it and it became a beautiful architectural detail. When I first walked into the space, an 8’ high drywalled pantry with sliding closet doors (also housing the refrigerator), stuck out like a sore thumb! I could not wait to see that go. What are the other highlights of the space? We installed floor to ceiling Alder wood warmly stained a taupe-grey cabinetry, the “Coastal” color from Greenfield Cabinetry. Incorporated the original wood post and beam as the “new” kitchen footprint. The wall incorporates a broom pantry for cleaning supplies, a pantry which houses office supplies for when they work at the kitchen island and this includes two file drawers, as well as a dry food pantry, tray storage and a baking pantry. This area houses a Monogram French door wall oven. The wall also incorporates upper wall cabinets in quarter sawn white oak with cerusing (also known as liming) from Greenfield Cabinetry. I added an additional custom aspect to the cabinets with “autumn” textured glass panel doors. This area now houses china and bar glassware. The base drawer cabinet houses the baking supplies needed next, which I placed next to a wine cooler. When this counter area isn’t being used for baking prep it also serves as a bar area for when the couple is entertaining. Above these cabinets are a row of cabinets for storage of items only needed a few times a year – all accessed by a custom walnut and iron rolling ladder, which is so beautiful it doubles as art when it is “stored” on the wall on other side of kitchen. Around from the baking counter, is the original location of sink, which continues to be the main clean-up sink. We also added an instant hot / cold filter water tab for convenience of people wanting water or a hot beverage – so they don’t have to get in the main cooking / prep area. A pull-out trash cabinet and dishwasher are on either side of the sink. Next to the dishwasher are drawers and cabinet with roll-out shelves which house the everyday glassware, dishes and silverware – giving easy access for everyone without having to disturb anyone who is in cooking area. Note the use of roll-out shelves here. I can’t imagine life without these! Turning this next corner is where all the cooking / prep happens. There is another double trash can pullout cabinet, this to the left of newly add prep sink, followed by a three drawer base, with a hidden drawer inside middle drawer, housing lids, pots and pans with a upper wall cabinet for frequently used cooking / can food items. We moved the Monogram French Door Refrigerator to the end of this run so it is easily accessed by everyone, not only by the person cooking but for someone wandering into the kitchen for a snack. The family’s narrative really needed a gathering spot and the large island is just that perfect spot. In the middle of the room, it features Quarter Sawn Oak in a barnwood stain with liming from Greenfield Cabinetry and a Monogram Induction cook top with the Monogram Advantium under it. The family loves this as it also acts as the microwave. There are a set of four drawers on each side of the cook top to house spice racks, knife storage and other cooking utensils. At the one end of the kitchen, we recessed a Smart TV which I framed out in salvaged wood. The family loves this to search for recipes, Skype, double as a large computer monitor when working from home and to just simply watch the news. Our ultimate luxury is to share time with loved ones and this kitchen now invites in this family. We defined their life patterns and then honored them via thoughtful design and product choices. When you walk into the first floor of this home now, it breathes in its’ surroundings and there is no bigger compliment I could receive from a space, than just this. Fred: I’m so over the white painted trend. I get it. It is timeless, but white kitchens are being installed in spaces, where white shouldn’t be used, as it is too stark compared to the other finishes in the home. I’m all about the natural neutral and think a naturally neutral painted kitchen can be quite the stunner. In fact, this was the exact situation with my parents kitchen when I remodeled it a couple of years ago. I used the “Silktassle” paint color from Greenfield Cabinetry for the naturally neutral paint color. My parents had wanted white, but they have oak trim in the home and white cabinetry would’ve felt really out of place in their space. Fred: Trending ahead? I love to watch what the trends are doing but I really design to the vernacular of the home; I listen to what the house is saying. No one will probably ever walk into a kitchen I designed and say, “Oh Fred Alsen must’ve designed this.” With that said, I do find the trend of blues in the kitchen pretty interesting. Blues tend to not reflect food well – it just isn’t a color we associate with food in our culture. When was the last time you ate a restaurant with blue décor? (Probably never.) Anyway, I’m excited to see where blues go in the kitchen, specifically navy. Blues started appearing in kitchens, bright blue painted cabinetry for example, a couple of years ago. Recently we are seeing a shift to navy. Everything from the kitchen’s perimeter featuring navy cabinetry with a gray island – to a kitchen featuring white cabinetry on the perimeter and a navy island. My feeling is this is a new twist on white kitchens. Why? White is timeless, and so is navy. We also tend to become braver with our cabinetry color choices in a stronger economy – so between this fact and so many of us are tired of seeing white cabinetry, I’m very curious to see where navy trends. SRFD: What have you learned from working with the team at the Monogram Design Center in Chicago? Fred: I love working with the team at the Monogram Design Center in Chicago! They are very knowledgeable and passionate about their products. It is a win-win for both my clients and me. I can quickly get the specs and information I need to design the client’s kitchen and then I can send clients into showroom to get first-hand experience how the products work and preform while enjoying lunch or dinner with the Chef on duty! Read the rest of Remya’s blog and let us know what you think. Margaret Charette with design firm Britto Charette attended the Design Bloggers Conference in Los Angeles, California, earlier this month and had the chance to see Monogram’s newest kitchen design concept. 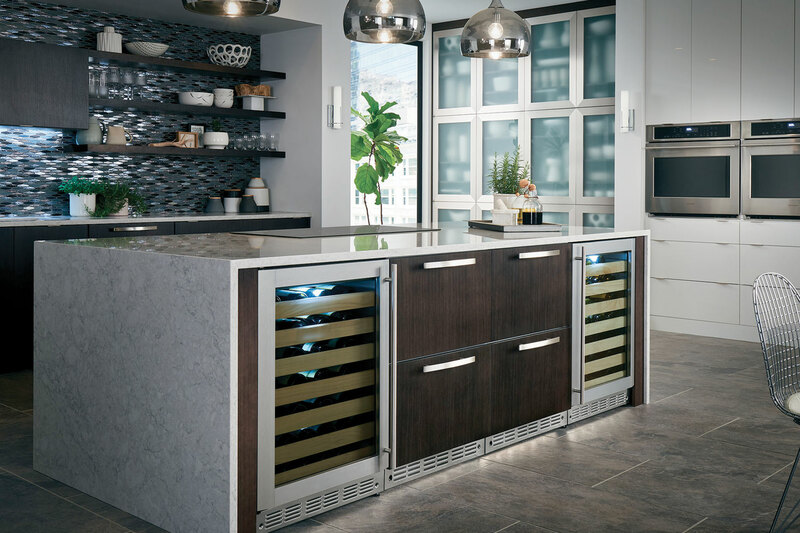 From touch screens that deliver step-by-step recipes to counter-top herb gardens grown by LED lights, Monogram is taking a look at how hi-tech kitchen design can create a healthier lifestyle. Read Margaret’s thoughts on this new concept in her blog post and share your thoughts! National award winning interior designer, Patricia Davis Brown, NCIDQ, ASID, CKD, CBD, was one of the attendees at this year’s Monogram Designer Summit last month. She shared her thoughts on the event and the need to consider what empathy, the theme of the 2017 summit, means to all of us on her blog, Dig This Design. Read Patricia’s blog and tell us what you think! Nancy Hugo, Certified Kitchen Designer and attendee at last week’s Monogram Designer Summit 2017 in Louisville, Kentucky, shared her thoughts about the theme of the conference – Empathy – on her blog, Designers Circle HQ. Take a look and let us know what you think!